If you were wondering how defense council for Khalid Sheikh Mohammed and the other four terrorists might proceed when they are brought to a criminal court in New York City, look no further than the Islamic response to the United States’ accusations signed by the four accused in March. That’s the question Scottish authorities are asking after a quick review revealed justice secretary Kenny MacAskill – who ordered the release of Abdelbaset Ali Mohmed al-Megrahi – only had one physician tell him the bomber had three months to live. https://radioviceonline.com/wp-content/uploads/2011/02/rvo-logo-4-300x100.jpg 0 0 Steve McGough https://radioviceonline.com/wp-content/uploads/2011/02/rvo-logo-4-300x100.jpg Steve McGough2009-08-28 16:30:222009-08-28 16:30:22Does Lockerbie bomber really have terminal cancer? Of course, he blames the Bush administration for this entire mess and states that Guantanamo Bay should never have been opened in the first place. Of course, he says he has a plan, but what if there is no funding for it and citizens don’t want to have these terrorists on US soil? Similar to Clintonesqe ideology, President Obama wants to treat this war – and he used the word war – as some sort of police investigation. The full transcript is below, but here are a few chunks. Allah at Hot Air has more, and Malkin has the dueling banjos theme going. Now let me be clear: we are indeed at war with al Qaeda and its affiliates. Where demanded by justice and national security, we will seek to transfer some detainees to the same type of facilities in which we hold all manner of dangerous and violent criminals within our borders – highly secure prisons that ensure the public safety. As we do so, we are acutely aware that under the last Administration, detainees were released only to return to the battlefield. Oh really, I thought that the recidivism rate quoted was no big deal? Some will be brought back to the United States to face a federal trial. Some will face military tribunals – which Obama referred to as abhorrent during the campaign! Where the heck will they be sent Mr. Obama? Where? Well gee, a plan to negotiate with other countries to take these 50 terrorists? How much is that going to cost? Of course, the last set of terrorists are the ones that can not be tried, but are a serious danger to the United States due to their background. Obama plans to hold them without trial – probably here in the United States – indefinitely with judicial and congressionalal oversight. Yeah, I’m sure that won’t be used as terrorist recruiting tool. Here’s the full text of today’s speech. From Hannity’s America last night. Bill Ayers talks with Alan Colmes in what must be part of the Bill Ayers rehab tour. Ayers, who’s Weather Underground bombed the Pentagon, New York City Police Headquarters, a New York State Supreme Court justice and was planning on bombing a dance at Fort Dix in New Jersey, still regrets nothing because … well he personally didn’t kill anyone. Make sure to catch the moral equivilency going on … which is always the classic defense when you can’t defend. Childish at best … evil at worst. Here’s Alan afterwards explaining Ayers to Hannity. I like Alan Comes, and he makes it clear he does not approve, but surely he’s not buying this crap from Ayers. By scheduling the shut down of Camp Delta, Guantanamo Bay and CIA secret facilities in other countries, President Obama – almost by default – has chosen to expand the rendition program that involves turning captured terrorists over to their home countries for interrogation. Morrissey at Hot Air has more. Renditions created a huge global controversy primarily because the home countries of the terrorists torture for information. Most of these terror suspects grabbed by the CIA come from countries like Pakistan, Saudi Arabia, Egypt, Jordan, and other emirates where the Geneva Convention only provides a veneer of respectability and not legal constraints of any kind. Critics complained that the CIA essentially “outsourced” its torture to subcontractors in this rendition process, ensuring that these methods would get used without getting their own hands dirty and getting the information torture produced. Ed provides linkage to a story in the LA Times. … the Obama administration appears to have determined that the rendition program was one component of the Bush administration’s war on terrorism that it could not afford to discard. Well what else would you do with captured terrorists? We can’t take them to the United States, Gitmo or to CIA facilities offshore. Send them home! For the last seven years, the Left has screeched hysterically over the CIA practice of rendition, in which agents turn detainees over to authorities in their home country for interrogation. Never mind that the practice started in the Clinton administration, and never mind that the other options were Guantanamo Bay, release, or two caps in the back of the head; they pilloried Bush over renditions as if he’d thought them up himself. Hollywood even made a movie about how awful the process is, apparently matched in awfulness only by the film’s box office. Exit question: Before terrorists could be assured that they would live – possibly to fight another day – when captured and held by the United States. Will the left step up and demand that Obama’s rendition program be stopped? Exit question 2 (the thoughtful one): Will terrorists be more cooperative with the United States when captured to ensure that they will not be sent home? Will we get actionable intelligence quicker? https://radioviceonline.com/wp-content/uploads/2011/02/rvo-logo-4-300x100.jpg 0 0 Steve McGough https://radioviceonline.com/wp-content/uploads/2011/02/rvo-logo-4-300x100.jpg Steve McGough2009-02-01 09:39:022009-02-01 10:51:53Could rendition program be considered torture? As many countries in Europe demanded the United States close the Guantanamo Bay detention facility, they refused efforts by the Bush administration to provide asylum or refugee status to prisoners who were ready for release. In Berlin yesterday, 27 members of the European Union made a weak attempt to support the new administration by offering assistance in closing the facility, but still would not commit to join together and accept inmates into the Union. What does this mean? Are they going to provide landing rights so we can refuel jets as we take the prisoners somewhere else? Note there were prisoners ready for release by the Bush administration, but nobody would take them. Thanks a lot for the support guys, next time keep your mouths shut. Again, no commitment from Europe, since they have been provided time to respond. … the EU is expected to play for time, arguing that, since it will take at least a year to close the camp, European countries have several months to produce a detailed response. The divisions show how difficult it will be for the Europeans to reach a united stance, said Karsten Voigt, the coordinator for German-American cooperation in the Foreign Ministry in Berlin. Portugal has stepped up and stated that they will immediately take prisoners who have been cleared for release and are not welcome in their own home countries, but Austria has said no way. Privately, many are saying that it’s America’s problem and we need to deal with it on our own. Well if it’s our problem why did you demand for months for us to close the facility? Here’s the problem European Union countries face; they have no internal borders. Unless they have some sort of special rule for released detainees and hold them in some sort of prison atmosphere, released terrorists will be able to freely roam between 22 countries. There are no longer any frontier controls at the borders between 22 EU countries. This is thanks to the Schengen agreement which is part of EU law. The Schengen rules remove all internal border controls but put in place effective controls at the external borders of the EU and introduce a common visa policy. The full Schengen members are Austria, Belgium, the Czech Republic, Denmark, Estonia,Finland, France, Germany, Greece, Hungary, Italy, Latvia, Lithuania, Luxembourg, Malta, the Netherlands, Poland, Portugal, Slovakia, Slovenia, Spain, Sweden (but not Ireland and the United Kingdom) plus Iceland and Norway (which are not EU members). Cyprus which joined the EU in 2004 and Bulgaria and Romania which joined in 2007 do not yet fully participate in Schengen. You will therefore need a valid passport or ID card to travel to those countries and to Ireland and the United Kingdom. If Portugal will take a few, will they be allowed to roam into Austria who does not want any of them? My guess is that you’re not going to see any agreement from EU diplomats within one year. Not going to happen. Two former guests at Camp Delta – it is now confirmed – are back in the fight after progressing through an otherwise successful Saudi rehabilitation program for jihadists after their release from Guantanamo. This is not surprising since there is a get-arrested-and-return-to-prision rate of more than 50 percent here in the United States, so one in ten – that we know about – is really not a failure; you had to figure some of them would go back to the jihad. Two former Guantánamo Bay detainees now appear to have joined Al Qaeda’s Yemeni branch, which released a video on Friday showing them both and identifying them by their names and Guantánamo detainee numbers. American counterterrorism officials have already confirmed that Said Ali al-Shihri, 35, who was released from the American prison camp at Guantánamo in November 2007, is now the deputy leader of Al Qaeda’s Yemeni branch. 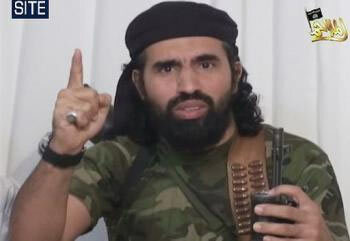 He is suspected of playing a role in a deadly attack on the American Embassy in the Yemeni capital, Sana, in September. Both men passed through a Saudi rehabilitation program for jihadists after their release from Guantánamo. That program has been seen as a model, and the Saudi government had previously said that none of its graduates had returned to terrorism. In the video released Friday, Mr. Awfi warns fellow prisoners about the Saudi program and threatens attacks against Saudi Arabia. He also speaks angrily about the Israeli attacks on Hamas in Gaza. This is an issue the Right should unite around immediately and in full force. 9/11 families are leading the way. Don’t miss this must-read from Michael Burke, brother of FDNY Capt. William F. Burke Jr., who was killed on Sept. 11, 2001, and follow-up from 9/11 Families for a Safe and Strong America. In reference to the photo of al-Shahri above, someone should really tell their team the belt holster thing-a-ma-gig holding the bullets looks cool, but would provide a reload time that could only be described as pathetic. I might be having a little fun since I’m pretty tired, but you can’t say that these guys are not dangerous. What is Yemen doing to shut this group down? Previous hot post… We need a National Terrorist Offender Registry.